Small business owners say they're worried that the new Boulder City Bypass will cause travelers to skip over their town. Austin Carter reports. 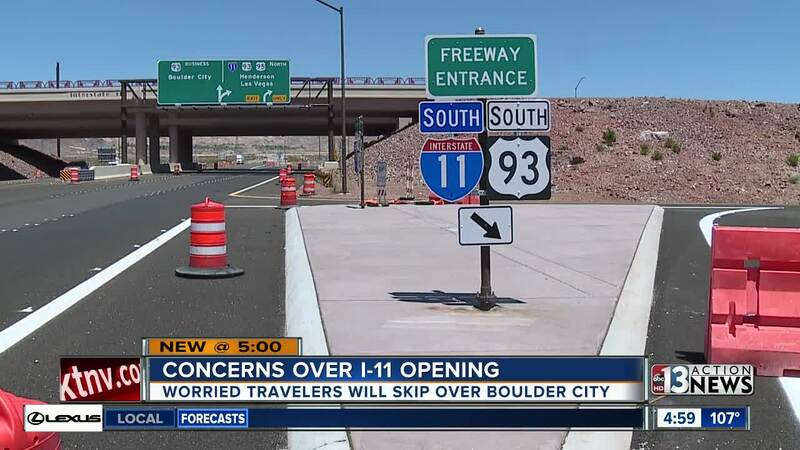 Concerns are brewing in Boulder City over fears that the new Interstate 11 Bypass will cause travelers to skip stopping into town. Along Nevada Way in Boulder City, you don't have to look far to find small antique stores and coffee shops. “I like this area because it’s quaint, it has all the things I wanna see,” says Lori Scherer, visiting from Ohio. Some spots, like Back In Time Antiques, have been here for 20 years. Owner Bill Smith says he’s seen folks stop and go on their way to Las Vegas over the years, but fears what's coming next. The bypass is a 15-mile stretch of Interstate 11 that will open to traffic on Aug. 9, linking Nevada with Arizona. At the east end, the freeway links up with the Hoover Dam Bypass, and on the west it links up with the existing I-515. The bypass essentially creates a quicker route for drivers that skips passing through Boulder City on U.S. Highway 93. This is a concern for small business owners who rely on travelers stopping in. At the popular Coffee Cup Cafe, there weren't many empty seats, but owner Terry Stevens says that could change. “Hopefully we don’t have to shave any staff off or anything,” says Stevens. No one knows for sure of just how this bypass will impact the city, but business owners are just hoping they won't have to close up shop. “I can’t imagine it getting any worse but I pretty much know that it will,” says Smith. The Nevada Department of Transportation says they are already in talks of what’s next for I-11, including an alignment north between Las Vegas and Reno.